CU Boulder will soon have new eyes on the sun. Two miniature satellites designed by researchers at the Laboratory for Atmospheric and Space Physics (LASP) are scheduled to launch later this month on Spaceflight's SSO-A: SmallSat Express mission onboard a SpaceX Falcon 9 rocket from Vandenberg Air Force Base in California. These "CubeSats," which are smaller than a microwave oven, are set to blast into a near-Earth orbit alongside more than 60 other spacecraft. According to Spaceflight, the SSO-A: SmallSat Express is the largest dedicated rideshare mission from a U.S.-based launch vehicle to date. The upcoming missions underscore CU Boulder's growing leadership in deploying CubeSats for scientific research, said Tom Woods, associate director of LASP. He explained that as opportunities to launch spacecraft from commercial missions like SSO-A expand, small-sized satellites will become increasingly popular tools among scientists. "The time is right to do more and more science with these small satellites," said Woods, the principal investigator of the MinXSS-2 mission. In part, that's because they aren't traditional satellites. CubeSats are designed to take on big scientific questions in small packages, often using off-the-shelf equipment to keep costs and weight down. The antenna for MinXSS-2, for example, is made from a hardware store tape measure that will spring into place once the CubeSat reaches orbit. A typical CubeSat mission costs around $2 million to build and operate—far less than a full-sized science satellite that runs into the tens or hundreds of millions of dollars. MinXSS-2 and CSIM were both funded by grants from NASA. "Launch costs go by kilograms," Woods said. "If you can get your satellites smaller, it costs a lot less to launch them." To date, LASP alone has deployed two of these lightweight spacecraft, with several more in the planning stages. One CubeSat that CU Boulder students operated from the roof of a building on campus helped to solve a six-decade-old space mystery around charged particles trapped in Earth's radiation belts. The two new CubeSats will build on that growing expertise, Woods said. CSIM is more compact version of a science instrument that LASP designed for the Total and Spectral Solar Irradiance Sensor (TSIS-1), which is currently collecting data from outside of the International Space Station. During its time in orbit, CSIM will point toward the sun, monitoring changes in the energy that the star sends toward Earth. Those shifts, including 11-year-long dips and peaks in the sun's activity, can play a big role in shaping climate across Earth. 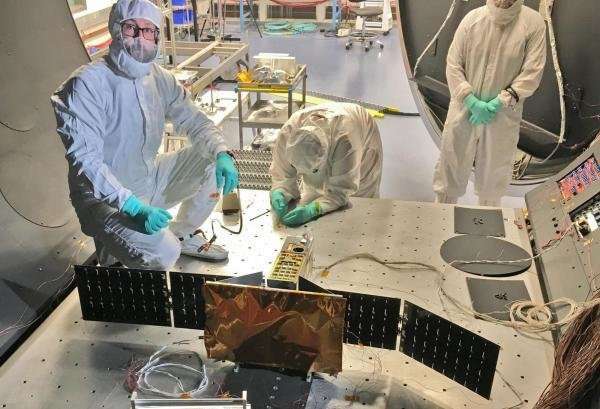 Blue Canyon Technologies, a company based in Boulder and founded by CU Boulder alumni, built the spacecraft, and the mission is led by Erik Richard, a research associate at LASP. MinXSS-2 is a follow up to MinXSS, which deployed in 2016 and operated for about a year. MinXSS-2 will stay in orbit for much longer—up to five years—but will also collect information on "soft" X-rays emanating from the sun. This high-energy radiation could reveal new information about how the sun's magnetic fields twist and snap, potentially sending huge bursts of charged particles toward Earth. Such eruptions can damage satellites orbiting Earth and cause disruptions in power grids on the ground, Woods said. "MinXSS-2 is monitoring the physics of these eruptions to determine why this energy is being released so explosively," he said. When the satellite launches next week, it will also be the culmination of several years of hard work by students at CU Boulder who helped to plan and piece together MinXSS-2. Because CubeSats are relatively fast to build, they make great educational tools, Woods said. Developing a CubeSat is "a three year program," he said. "Students can come in and do the whole thing. They can help design, build and fly it within their student career. With big satellites, you can't do that."